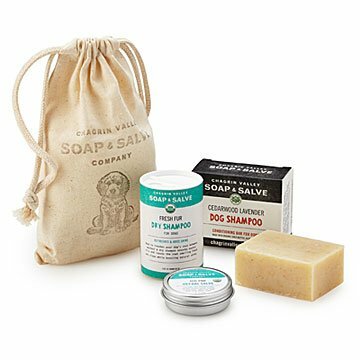 Refresh and soothe your best friend's coat and paws with this set of organic grooming goods. Dogs parted ways from their wolf-like ancestors about 10,000 years ago. Ever since, we've been housing, grooming, and carrying our beloved canine companions around like four-legged royalty. So don't be surprised that this grooming set features cedarwood-lavender dog soap (with naturally flea and tick-repelling essential oils) and fur-freshening dry shampoo. Made with 100% organic ingredients, the set also includes paw salve that protects and soothes pads subjected to dry, cold conditions or salted pavement. It's a complete spa treatment for your best friend and, after all, isn't that the least you can do given all that unconditional love? Handmade by Ida Friedman Kasdan in Solon, Ohio. From neo-natal nurse to middle school science teacher to soapmaker, Ida Friedman Kasdan's career path has been a journey filled with the love of people, nature, science, and learning. After spending a decade in nursing, she got her Master's in Biology and taught middle school science for 16 years. Throughout her work, Ida's favorite job description has been "mom," collecting memories of games, walks in the park, story times, and family holidays. As a breast cancer survivor, she delights in growing older, living each day to its fullest, and doing things she loves to do with passion. Her soapmaking studio is infused with everyone and everything that has enriched her life.